In this article, we would like to introduce a tasty and healthy dish that attracts many generations of Vietnamese people all over the country – a ‘must-try’ dish for tourists – the instant noodle with chicken stew with herbs. Also, we will reveal the ingredients and the ways to make this dish at home as well as where to eat it in Hanoi. Let’s open this secret now with VinaFood! 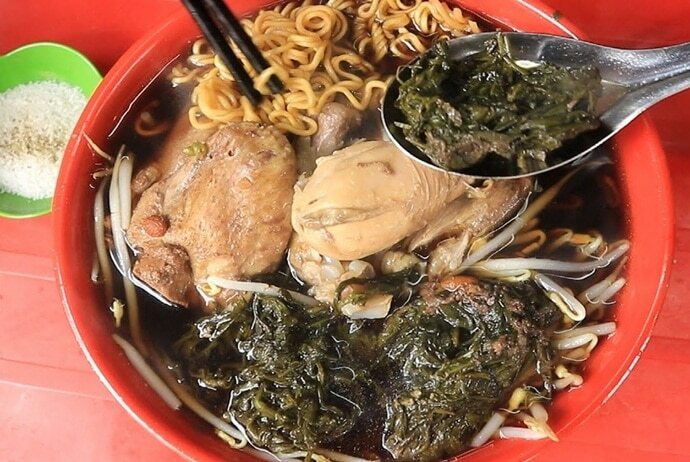 The instant noodle with chicken stew with herbs is a Hanoi’s specialty and it is a special mixture of secret spices and herbs. The result is 1/4 of chicken bobbing in a sweet and tasty broth, which is thought to be good for human health. A bowl of this dish will increase energy and vitality, helping us sleep better, giving strength to the bones and tendons, and simultaneously reducing backache and asthma. Choosing the right chicken is very important. An old chicken is too tough while a spring chicken may not bring the right flavor. However, when choosing the perfect chicken, the cook will need to marinate it in spices and salt for about half an hour before simmer it with nuts, seeds as well as medicinal herbs.The instant noodle with chicken stew with herbs includes a bowl of noodles, sprinkled with bean sprouts on top. 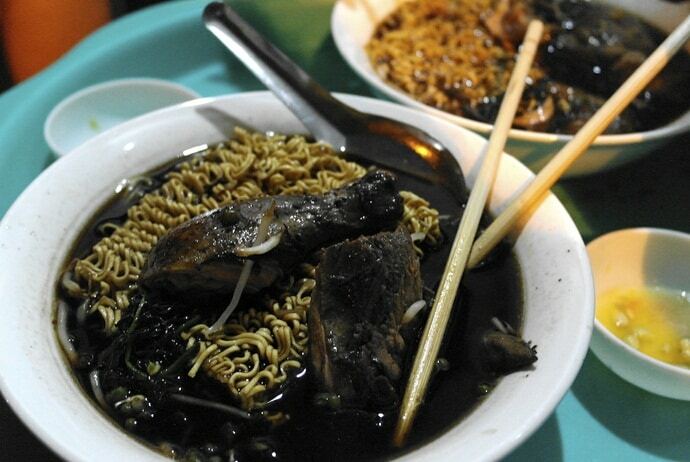 Then, blackened chicken is piled over the noodles and sprouts, followed by bitter mugwort or “rau ngải cứu” and the trademark black broth. 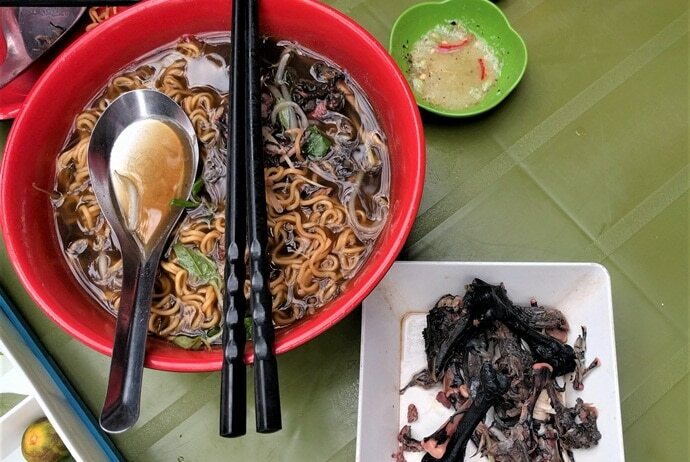 The chicken may sink to the bottom; the noodles may float to the top; and the bowl of black broth makes it a great dish. There are a few places in Hanoi where you can enjoy the instant noodle with chicken stew with herbs. Actually, all of these restaurants are famous for those who love this dish. They are always packed with customers, especially on cold evenings. Therefore, you should try visiting any of these restaurants to enjoy this nutritious, healthy and delicious dish. 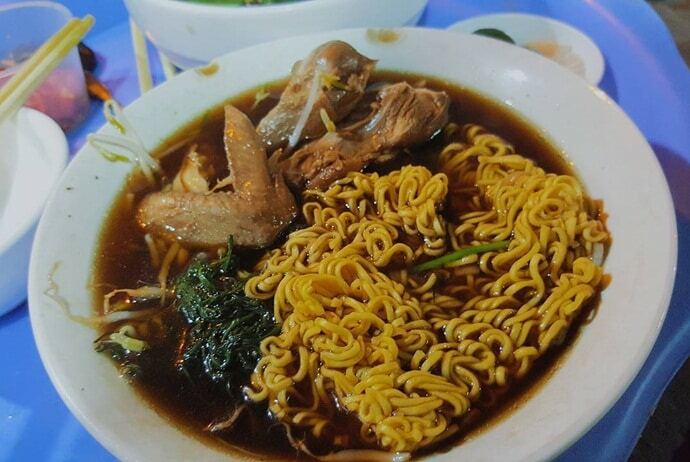 When you are looking for a restaurant that sells instant noodle with chicken stew with herbs, you should not skip the restaurant on Hang Bo Street. Chickens here are cleaned and cooked with medicinal herbs for about an hour so that they can penetrate into each fiber. These herbs are slightly bitter, but they will be very suitable and unforgettable. On the cold days, just smelling the smell from the bowl is also able to warm up the body. The sweet smell of chicken combined with the smell of the lotus seeds, wormwood as well as other herbs can make you forget the cold outside. Chickens have absorbed the medicinal herbs and turned to light brown, so they look attractive and fragrant. The soft and sweet chickens will make those who eat them once cannot forget. Although this shop is cramped, dinners still come here every evening. It has been opened for more than 20 years and contributes to the cuisine of the Old Quarter. Dinners can call a bowl of chicken if they still crave after finishing. The bowl includes 4- 5 chicken pieces. People who are afraid of the bitter taste of tamarind can also enjoy this dish, because the wormwood is fried with the chicken stew water, so it is sweet and not too bitter. 70,000 VND for a bowl of instant noodle with chicken stew with herbs is not cheap, but it is worth trying due to its high quality. In addition, chicken legs are sold at only 6,000 – 8,000 VND. Therefore, when it comes to instant noodle with chicken stew with herbs, noone does not mention the restaurant on Hang Bo Street. Read More: Vietnamese Fresh Rice Noodle Rolls – Check out Pho Cuon in Hanoi style! 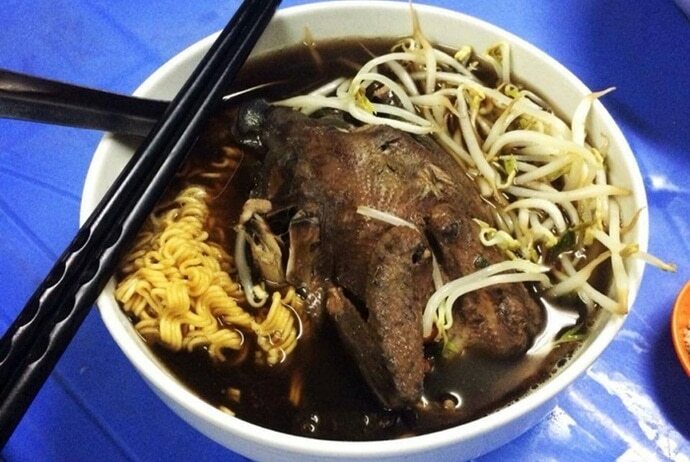 The instant noodle with chicken stew with herbs is one of Hanoi’s most attractive dishes. Apart from being delicious, this dish is also healthy and fulfilling. Consumers have two choices: the ‘regular’ chicken or a miniature chicken named a black-bone silky. The chickens are soaked with aromatic medicinal herbs. Next, they are placed over heat, helping the meat soak up all of the flavors while simmering. After that, noodles will be added to the stew. Diners can easily find easily this restaurant on Tong Duy Tan Street. It has opened for long, but the flavor still remains. A bowl of instant noodle with chicken stew with herbs is combined with many medicinal herbs such as ginseng, wormwood, lotus seeds, etc. In particular, it should mention ginseng, because without this ingredient, you will not get the right flavor. Chickens should be a little older and they should be stewed for about an hour before removing to a warm pot. Not only Vietnamese, but also foreigners love this dish. The chicken broth combined with the sweetness of meat and the taste of the medicinal herbs, all of which create a delicious taste. This restaurant opens from 9 a.m to 11:30p.m, with prices ranging from 50,000 to 110,000 VND, depending on the different kinds of chickens. Actually, this is known as one of the best places where you can enjoy instant noodle with chicken stew with herbs in Hanoi that you should not skip, especially if you love Vietnamese cuisine. This restaurant on Hang Cot Street is one of the best places where you can enjoy instant noodle with chicken stew with herbs. Chickens are selected to cook until soft. The wormwood is placed into the heart of each chicken, so it is so fragrant and the bitter taste is not much. The medicinal herbs are added properly, so this dish is suitable for customers who have mild palate. After cooking, chickens are brought out for the diners to enjoy. This instant noodle with chicken stew with herbs is nutritious and suitable for winter. Having a bowl of hot noodles on the cold days can help us warm up our bodies. This restaurant opens from 6a.m to 11p.m. Most of the staffs are family members, and they are friendly to the diners. The price for each kind of chickens ranges from 50,000 to 80,000 VND/ bowl. 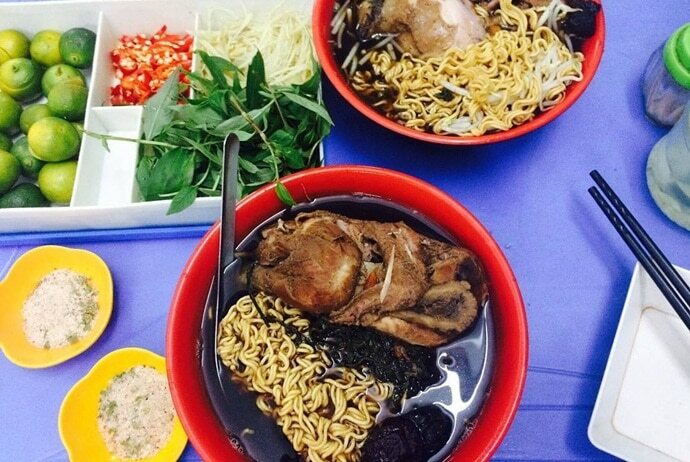 Actually, if you love the instant noodle with chicken stew with herbs, you should not skip this restaurant on Hang Cot Street; instead, you can invite your friends and family members to enjoy this delicious and healthy dish on cold days. Actually, all of the restaurants mentioned above are famous when it comes to instant noodle with chicken stew with herbs. Thus, if you have a chance to visit Hanoi or if you want to enjoy a nutritious and healthy dish when you have recovered, you should consider visit any of these restaurants to enjoy this chicken dish. Actually, this dish is very delicious, nutritious, and good for health thanks to its medicinal herbs. Now, let’s try out this dish to reap all of its benefits and enjoy the unique taste of this dish.